I got a SS 29er w/ track ends, so this setup is new to me. I'm converting a 90's TREK MTB w/ vertical drop outs. I got a new KMC X8.93 chain. Now, how loose should I make/cut the chain before engaging the tensioner? I'm running a 32Tx16T ratio. This is a cool little tensioner. It's pretty easy to setup. If you don't go as short as possible it probably won't have enough swing. Thanks. I should have mentioned that I'm going to have it pushing down on the chain, not up. Not sure if that matters. 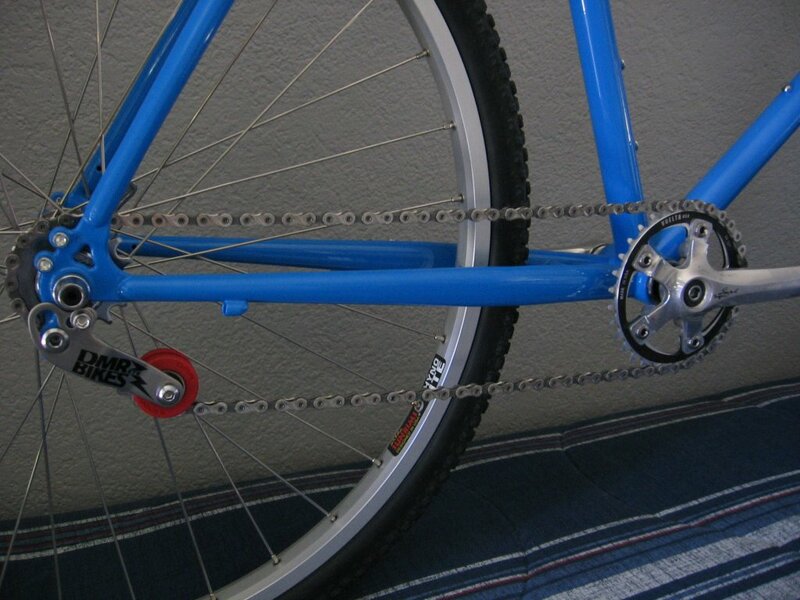 push up is better (more teeth engaged on the cog) but requires the chain to be shorter and on some setups will require a 1/2 link to get the chain right. My $.02: shoot for a push up setup, if it doesn't come out but push down works then rock that and if there are no problems, be happy and forget about it. I'm using a DMR-STS in push up mode and it is one of those nice forget-about-it parts. No worries, rock solid. Thanks again guys. Just put it all together. All brand new parts on this bike build. Or at least most of 'em. Ya dig the powder coating? I couldn't make push up work with my setup either. Pull down is working fine and has similair chain wrap as a derailluer setup. The only thing I am worried about is that the adjustment is nearly maxed out (very close to yours) so I have little room for changevas the chain stretches and the teeth wear. If that happens I'll be looking at a half link. Good luck. I'm setting another one up tomorrow for my son. Well, this is a temporary setup until I can get the parts for gears. I figured I can convert to SS and ride it as I save up. 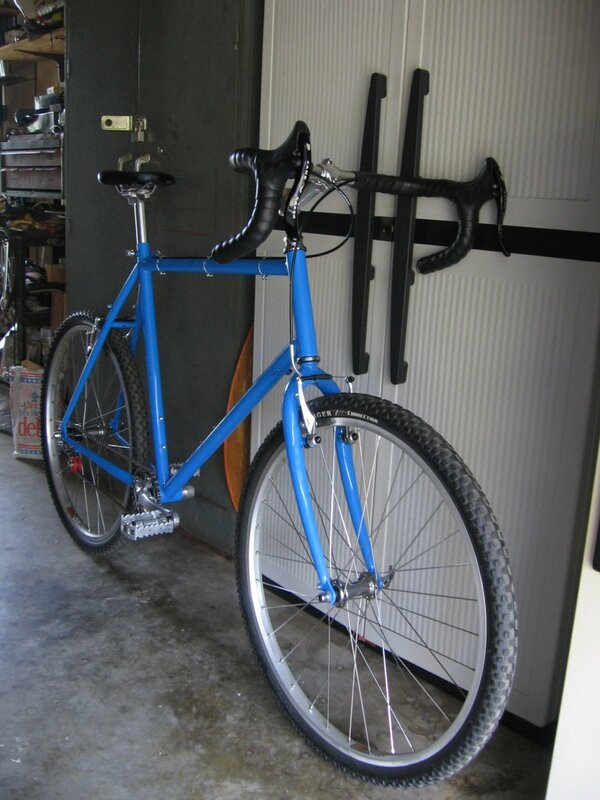 This is a touring bike conversion. Frame geometry is equivalent to an ideal touring bike, along with the frame/fork being steel. You should put up a shot of the whole bike! I will. Just waiting for the brakes, bearing grease and headset wrench. I wanted to try out the SS setup, so I must admit I packed the bearings with Vaseline. Bike rides and responds very well. Couldn't go too far as I have no brakes. Lol. I'm sure everyone would say that's terrible, but I bet the Vaseline will be fine until it gets hot enough to run out. And that's exactly why I did it in the morning. It's hot out here in So Cal, but I keep all bikes indoor(s). A not-so-great photo. Been raining all day. But you get the idea. 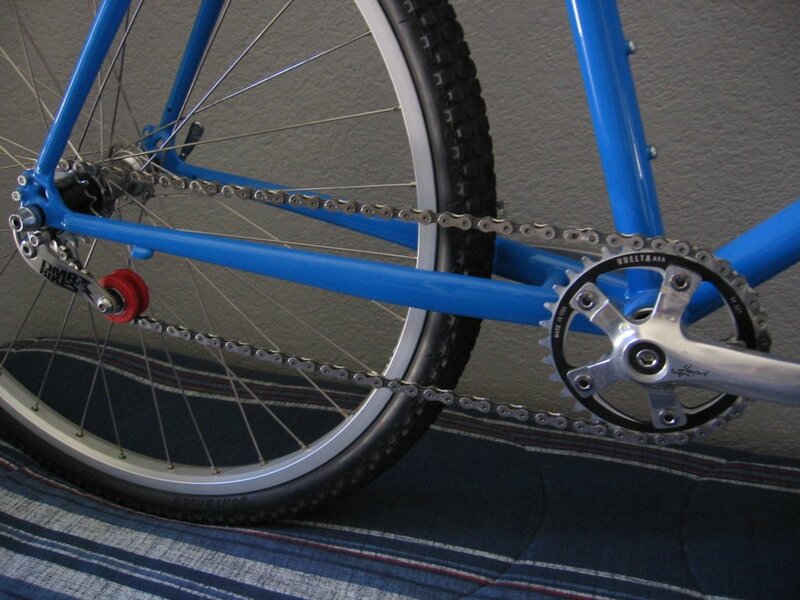 Single Speed to Geared Conversion? Setup Recs. What Tire Setup Do You Use, Tube in Tire or Tubless Tire Setup?